While Ngala Tented Safari Camp never lets you forget that you are in the wild, there is nothing primitive about this chic and contemporary camp. 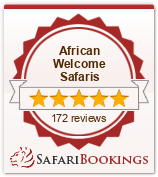 Why stay at Ngala Tented Camp? Peering out onto the banks of the seasonal Timbavati River from the shelter of dense indigenous trees, six tented suites offer a tranquil escape for wired city dwellers and frazzled travellers alike. The sights and sounds of the bush provide a gentle backdrop to life at Ngala, as the ancient patterns of African life carry on around the Camp. Every step unveils a new surprise, whether it’s a dainty impala tripping down the Camp path or a smart detail in the clean lines and flamboyant styling of the guest areas. Caught between dense riverine forest and the sandy bed of the Timbavati River, extensive viewing decks give guests front row views of game wandering down to drink. A rim flow pool mimicks the contours of the river bed, inviting in for a refreshing dip. At night, when tales of the day’s adventure are shared and compared, a roaring fireplace springs to life. The stirring scents of Africa’s famous spices waft up from a meal shared in a spectacular setting – among islands or reeds in the dry Timbavati riverbed, beneath the canopy of massive trees or on our expansive deck. Twice daily game drives – early morning and late afternoon / evening game drives in an open 4×4 safari vehicle traverse an area of 14 700 hectares (36 300 acres), which shares an unfenced boundary with the world-famous Kruger National Park. Track the Big Five, as well as a rich variety of other game, in the company of an armed ranger and tracker. Strict vehicle limits at animal sightings ensure the exclusivity of your wildlife experience and careful off-road driving positions you for the best photo opportunities. Rangers are constantly in touch with each other to help keep track of game and the sensitive approach methods used mean that the wildlife has become accustomed to the presence of vehicles. Night game drives provide a fascinating glimpse into the lives of the predators, particularly the leopard for which Ngala is renowned. Interpretive bush walks – in between game drives, take a leisurely walk within easy reach of your lodge and experience the sights, smells and sounds of the African bush. An armed ranger will accompany you and will share his vast knowledge of the local fauna and flora. Take in the intimate details of your surroundings, from the intricate patterns of a spider’s web to the bright plumage of the local birds and the sharp alarms calls of a dozen small creatures. Wonder at the delicate beauty of the leopard orchid, which flowers in the forks of tree boughs in early summer, taste the fruit of the marula tree or examine the meringue-like nests of the foamnest frog suspended from branches on the edge of pools of water.